There are Oreos, but then there are these. 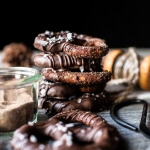 Chocolate covered pretzels replacing the cookie? That’s a big fat YES in my mind. 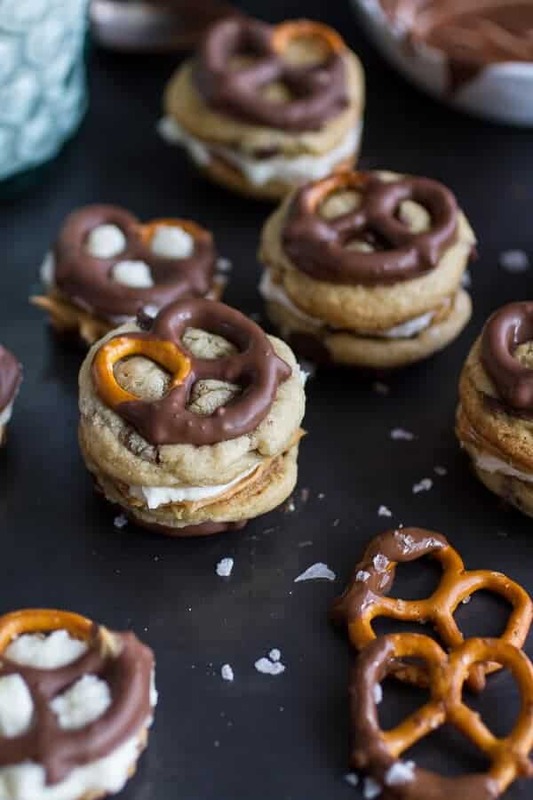 Not only are there chocolate covered pretzels involved, but if you wish, there can also be chocolate chip cookies. It is all about the options….and your personal preference. Really though, I just could not decide which version I liked best, so I am giving you both. Options are better than no options in my opinion. Plus, these are two very good options. You really can not go wrong with either one. If I were you, I would just do a little of both. Variety is the spice of life, right? Since it is Friday and since these cookies make me a happy inside, I have to tell you a little thing that happened to me the other day that turned my white snowy day right around. I got the nicest, most genuine phone call. The thing is, this person could have just emailed, but he actually called. Really it was something that he SO did not need to call about, but he did… and it totally made my day. This person is just someone I work with and he was calling about this thing that is going on right now (<–check it out if you can!). He was so genuinely excited and so thoughtful that it was insane. He only had the nicest things to say. Not even my grandma called to congratulate me, but he did. Actually, this is probably the nicest phone call, or really conversation, I have ever had. I am not even sure if that is just sad that in twenty years of being on this Earth this is my fist experience like this, or just plain awesome that it happened. I am going to go with awesome because I am trying this new thing out. This new thing is called being positive as much as humanly possible. Easier said than done, at least for me. My point is that this phone call made me realize that kindness is the key to life, and that making someone else feel amazing, will in return make you feel just as good. Sometimes phone calls are a million times better than any text or email. I mean, I cannot even the remember the last time I picked up the phone to actually call someone. Well, I can but it was a business call and really that is the only time I make phone calls. Personal conversations are done mostly through text, sometimes email. My generation is all about the texting and emails, and I am mostly all for that, but sometimes a phone call is really awesome… and needed. Even if you don’t know it is needed at the time. Alrighty, moving right along. I am hoping these cookies will put a big smile on your face, and they should, because they can be made in no time. Especially if you choose to skip the chocolate chip cookies. Here is the thing. The chocolate chip cookie version is decadent, very decadent… but also very delicious. 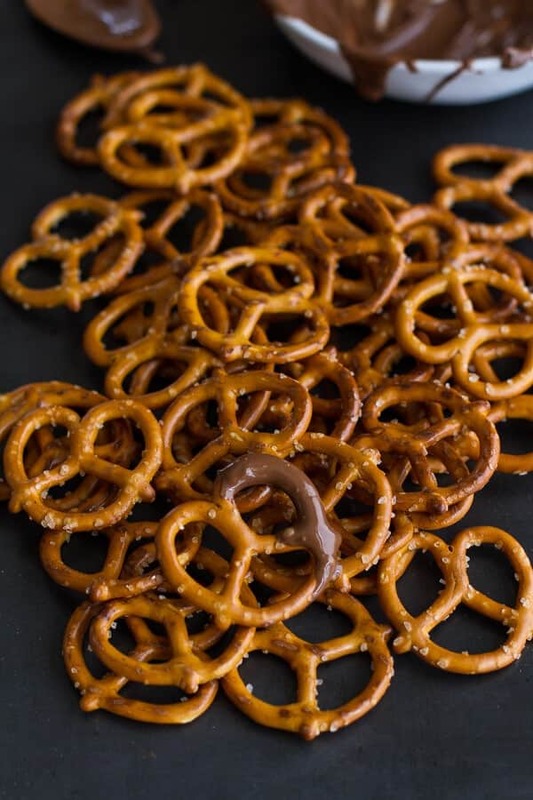 The just pretzels version is more of an everyday treat (while at least everyday around here), possibly even a snack. Not too sweet, but just sweet enough. So very good. Both versions are super quick and easy. Making them kind of perfect for a Friday. Oh, oh, oh, and you could make them while this is baking in the oven. Yes, eat a cheesy, pasta dinner and then go to town on some chocolate. Sounds like a pretty good Friday night to me. 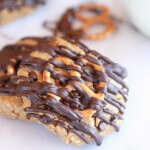 Peanut Butter Stuffed Chocolate Covered Pretzel “N” Cream (NO COOKIE VERSION). I am hoping these cookies will put a big smile on your face, and they should, because they can be made in no time. Melt chocolate in the microwave on 30 second intervals, stirring between each, until smooth. You may also use a double broiler. 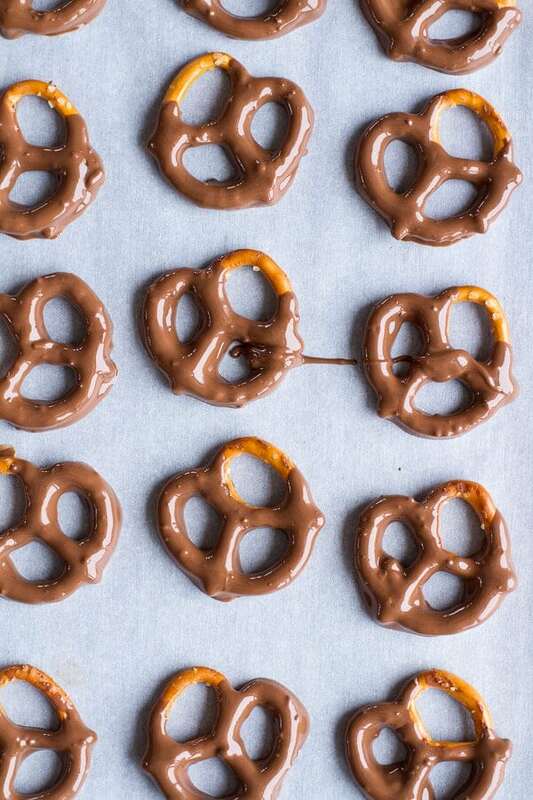 Dip each pretzel in chocolate, allowing excess to drip off. 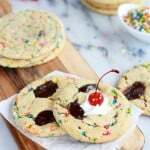 Place on wax paper lined cookie sheets and chill in the freezer until firm, about 10 minutes. Meanwhile make the cream filling, in a mixer, beat the butter until smooth and creamy. Add sugar and vanilla and beat until smooth. Add heavy cream and salt and continue beating until smooth again. 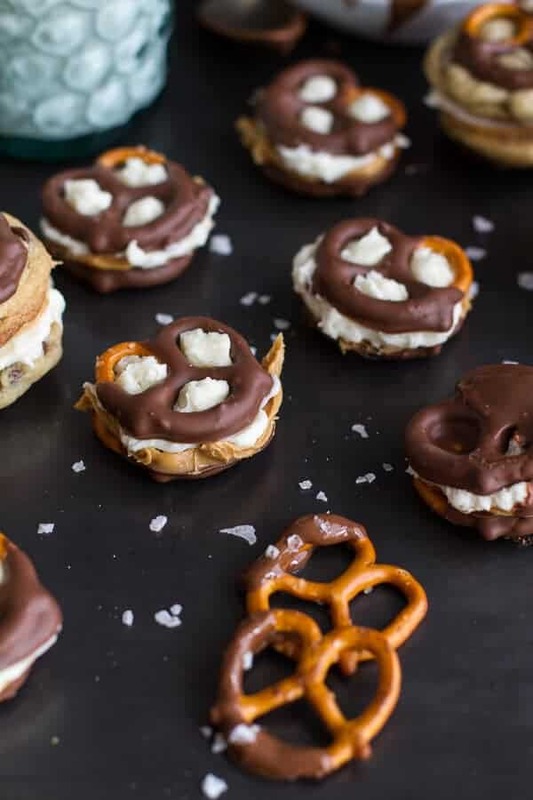 To assemble, flip the pretzels over and spread one pretzel with the cream filling and one pretzel with the peanut butter. 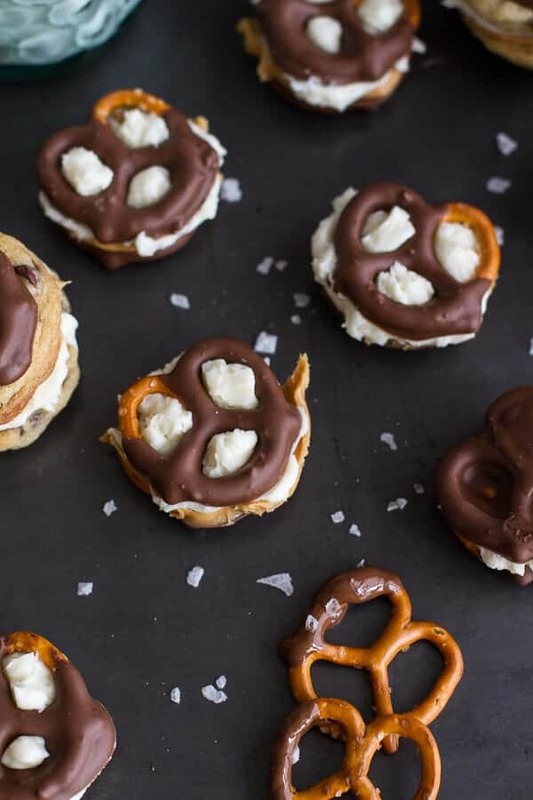 Sandwich the pretzels together and place on a baking sheet. They are going to ooze out, but that is fine. I recommend keeping the pretzels cool so that the chocolate does not melt. Repeat with the remaining pretzels until all the cookies and or filling has been used. Keep the pretzels in the fridge. 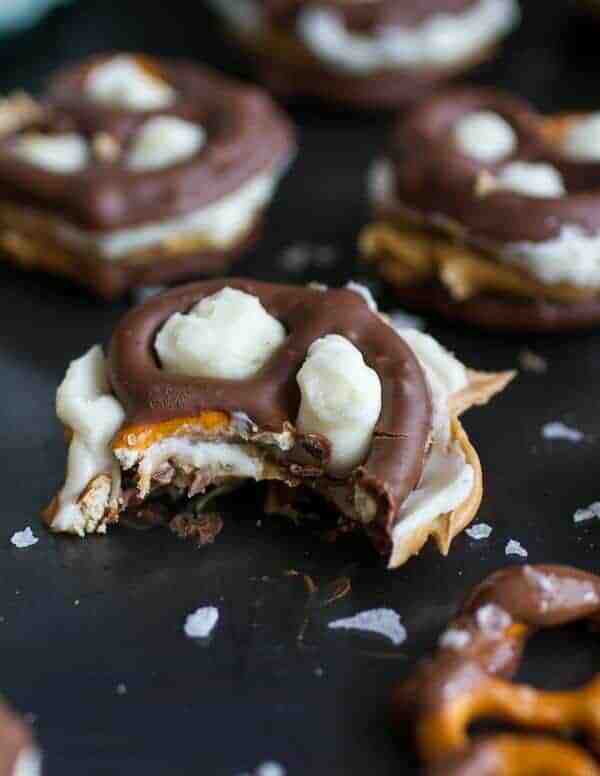 Peanut Butter Stuffed Chocolate Covered Pretzel Cookies “N” Cream. Preheat the oven to 350 degrees F. Grease two cookie sheets. Combine the flour, baking soda and salt in a small bowl. Beat the butter, granulated sugar, brown sugar and vanilla extract in large mixer bowl until creamy, about 3 to 5 minutes. Add the eggs and beat well. Gradually beat in the flour mixture. Stir in the chocolate chips. Roll the cookies into 20-30 teaspoon size balls and place them on the prepared baking sheets. Bake the cookies for 7-9 minutes, until the cookies are very lightly golden on top and a little doughy in the center. 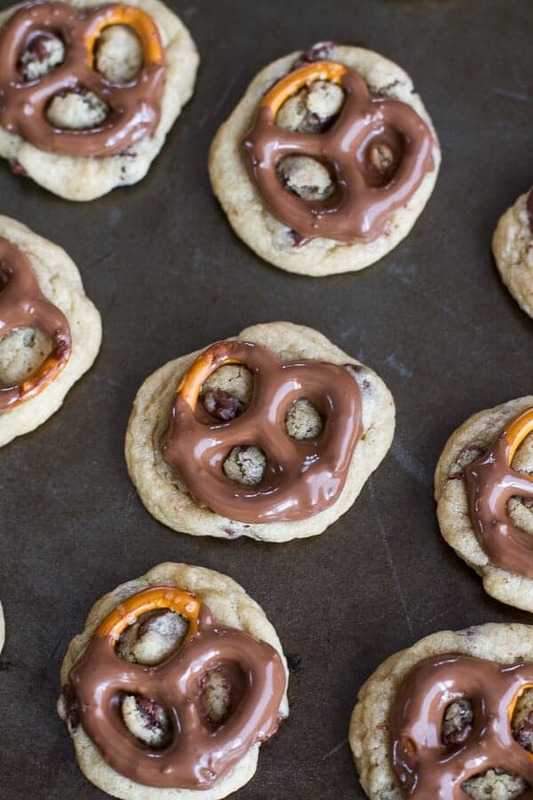 Immediately and gently press the cold chocolate covered pretzels into the warm cookies. Allow the cookies to cool completely before sandwiching. I recommend keeping the cookies in the fridge so the chocolate does not melt when you sandwich the cookies together. To assemble, flip the cookies over and spread one cookie with the cream filling and one cookie with the peanut butter. Sandwich the cookies together and place on a baking sheet. I recommend keeping the cookies cool so that the chocolate pretzels do not melt. Repeat with the remaining cookies until all the cookies and or filling has been used. Keep the cookies in a cool place or in the fridge. Pasta and Chocolate? Yup, that’s a dang good Friday! Oh, and you’ll probably want a glass of wine or a beer, so add that in there too. Fridays… gotta love em! I really liked this post and how real you were! Kindness IS the key to life, and staying positive can be SO hard. But we can choose to do it! Love that girl! Aww! Thanks so much, Taylor! Have a great weekend! I would say you have an excuse with your mom though. I mean those over seas calls are so much money! Tieghan, you did it again, this is brilliant! You never cease to amaze me with your creations. This is such a super take on salty-sweet. Love! I’m also so bad about talking on the phone. Especially to my mom or my future in-laws. But I have to remind myself that one day they won’t be there to talk to, so I might as well do it while I still can. These are really cute and they seem fairly easy to make! I love chocolate covered pretzels, how creative! Thanks so much, Ali! Hope you have a great weekend! I don’t even know what the best part of these cookies is. I love every layer and want to get lost in a cookie comma! What a heart warming story! Congrats on your success. You do a fabulous job and these cookies look amazing! Thank you so much, Jenn! Have a great weekend! What a great weekend treat! Love the combination, girl! Thanks Sandy! Hope you have a great weekend! I’d take these over an oreo any day! Sweet goodness these look good! Congratulations, Tieghan!!! That’s so exciting!!! 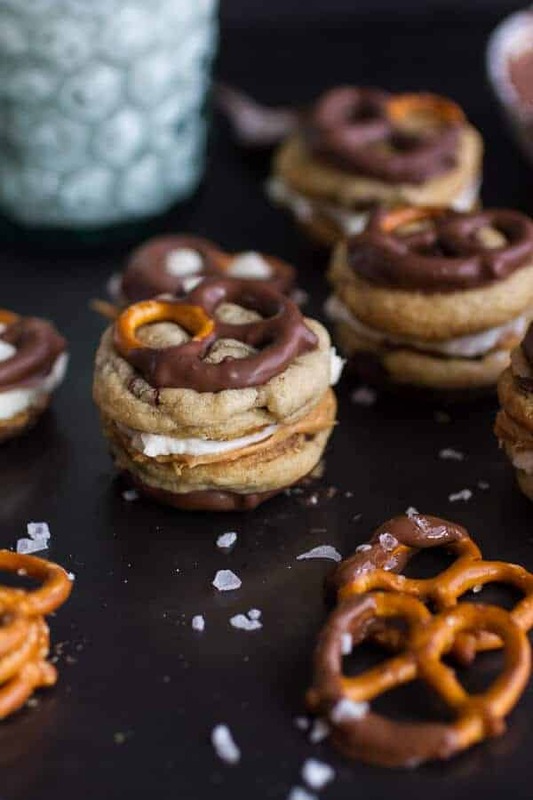 Love the combo of the cream, peanut butter, and chocolate covered pretzels, then you throw the cookies in there? Insane – in a good way! Congrats on the nomination and loved that you were thrilled a genuine phone call! Way better than oreos! 🙂 What a nice phone call and reminder about how much kindness can impact other people, I love that. Thanks Tieghan! I have to say, Oreos are my favorite, but I would totally reach over them to grab some of these. I love all the things you combined to make these! These little cookies look great and congrats on your nomination!!! You deserve it. Thank you so much, Meagan! That means a lot! Have a great weekend! And these treats look like pretty much perfect. Gorgeous photos. Aww!! Thank you so much, Abbie! That means so much to have your support and your excitement! Have a great weekend! I’m a huge fan of salty and sweet desserts! Both versions of these look amazing! 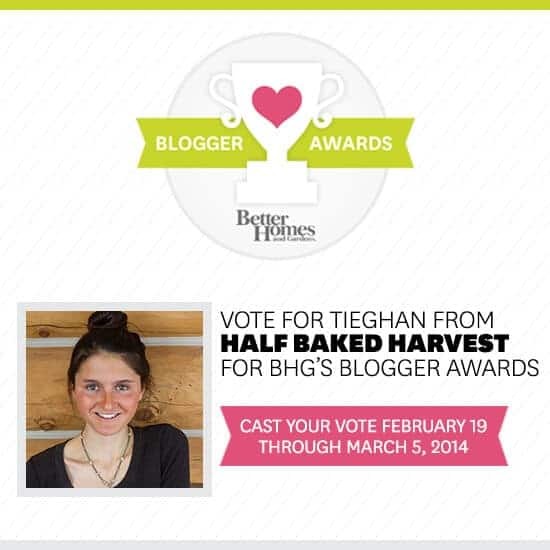 Congrats on your BHG nomination as well! THESE. ARE. INSANE. Seriously, SO good. Congratulations on your nomination! I love this! Phone calls are all too good. And I love your idea of being positive. I think that is totally possible, and the more your outlook on life changes, the happier you’ll be. Yay for happiness!!! 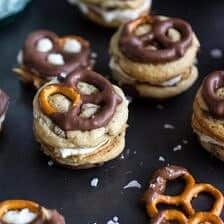 😀 Also, I really want to make these pretzel cookies. Totally delicious! Have a great weekend, Tieghan! Thank you so much, Lauren! Have a great weekend! crazy good combination. being positive and nice to others helps everyone feel better. nice post! Congrats Tieghan! Although I am not surprised because your recipes are totally amazing!! 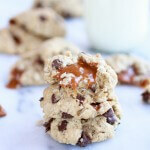 Also, I am totally the cookie version of this recipe! Thank you so much, Laura! Have a great weekend! These look like heaven in a small package! Pinning! Thank you so much and for pinning, Paula! Haha! Thank you so much, Sue! I have baked the same cookies and I should say that they are extremely tasty! My kids loved it so much that they have eaten everything at once! My husband asks me to bake the same ones for him one more time! These are so fantastic Tieghan! WOW. Thank you so much, Dorothy! Hope you are having a great weekend!